A little over a year ago I wrote a postabout the flipped classroom, why I loved it, and how I used it. I have to admit, the flip wasn’t the same economic and political entity then that it is now. And in some ways, I think that matters. Here’s the thing. When I recently re-read the post, I didn’t disagree with anything I’d said. Yet my brief love affair with the flip has ended. It simply didn’t produce the tranformative learning experience I knew I wanted for my students . When I wrote that post, I imagined the flip as a stepping stone to a fully realized inquiry/PBL classroom. And the flip’s gradual disappearance from our learning space hasn’t been a conscious decision: it’s simply a casualty of our progression from a teacher-centred classroom to a student-centred one. 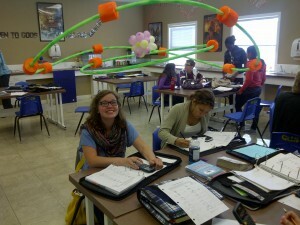 The flipped classroom essentially reverses traditional teaching. Instead of lectures occurring in the classroom and assignments being done at home, the opposite occurs. Lectures are viewed at home by students, via videos or podcasts (found online or created by the teacher), and class time is devoted to assignments or projects based on this knowledge. In theory, this sounds terrific. When I first encountered the flip, it seemed like a viable way to help deal with the large and sometimes burdensome amount of content included in my senior Biology & Chemistry curricula. So many times in the past I had thought what many science teachers must think: “I’d love to do more hands-on activities, but we have to get through the content first.” The flipped classroom might offer a solution. As I shifted my classroom from teacher-centred to student-centred, my students began to do lots of their their own research. Sometimes this resulted in them teaching each other. Sometimes they created a project with the knowledge they were acquiring. But the bottom line was that their learning had a purpose that was apparent to them, beyond simply passing the unit exam. What was my role? I helped them learn to learn. I prompted them to reflect on their thinking and learning, while at the same time I shared my own journey as a learner. I helped them develop skills such as using research tools, finding and evaluating sources, and collaborating with their peers. My goal as a teacher shifted from information-giver and gatekeeper to someone who was determined to work myself out of a job by the time my students graduated. 1) I dislike the idea of giving my students homework. Really? Yes. Students spend over five hours a day engaged in academic pursuits. I think that is enough. Recently I’ve been reading Alfie Kohn’s book The Homework Myth. He has mined the research on homework thoroughly, and — overwhelmingly — it shows that homework has no long-term impact on academic achievement. That’s likely shocking to some teachers. But beyond this, I think there’s more to life than being engaged in academics. Students need to participate in a variety of pursuits — sports, music, drama, meaningful jobs — to fully develop all of their talents and discover areas of interest. Furthermore, students need to spend time with their families. What right do I have impinge on this? 2) A lecture by video is still a lecture. This summer I had the opportunity to speak with a superintendent from a division outside of my own. He was curious about the flipped classroom. We were with a group of educators and he asked if anyone present had used it. Since I was the teacher with the most experience with it, I spoke about what it looked like in our classroom. Mostly I talked about inquiry learning and student choice. Of course, the reality is that many if not most teachers who opt for the flipped classroom strategy are not pursuing a student-centred approach to teaching and learning. The traditional model of learning is simply being reversed, instead of being reinvented. The lecture (live or on video) is still front and center. Learning isn’t simply a matter of passively absorbing new information while watching a lecture on video; new knowledge should be actively constructed. When we shifted to a student-centred classroom, my students took control of their learning, and I quit lecturing. I haven’t lectured in almost two years. 3) I want my students to own their learning. It’s been stated that “At its most basic level, the flipped classroom gives students more control over their educations, allowing them to start and stop or rewind important lectures to focus on key points.” To me, this isn’t giving students control over their education, although it may be creating new markets for content-oriented videos and related materials. In our classroom, we sit down with the curriculum, and students actually see what the outcomes and objectives are. We then have a dialogue about what my students’ learning might look like. They have a choice over what order they are going to work on outcomes, how they are going to learn and reach those outcomes, and how they are going to show me what they have learned. 4) My students need to be able to find and critically evaluate their own resources. Consequently, if I’m continuously handing them resources, they are not going to learn this skill. It’s more important for my students to learn to learn than to absorb the content in any video I might make and hand to them, with most of the thinking already done for them. What did our classroom become instead? Last year in my Chemistry class, our last unit was on Stoichiometry, which, essentially, is chemistry math. We had approximately 10 concepts to learn in 8 weeks. Each concept built upon the other, so there was a specific route we had to follow for it to make sense. Beyond that, how we got there was completely open. What happened over the coming days is that my students fanned out. Some shot ahead because they found the initial concepts quite easy. Others needed to hunker down to really grasp them. My students differentiated their own instruction. They worked at their own pace, since they chose their own resources. They could do extra work at home if they felt it necessary. I talked to every student every day. I could look at their work, have them articulate their thinking process, and see where they were struggling. I could spend time helping those who really needed it. The thing I find about Chemistry is that many students lack the background knowledge to begin to make the neural connections that are essential for understanding it. Some students experience a great deal of cognitive dissonance, and when they do, we talk about that in the context of their brain development. To work through the concepts, some chose on-line stoichiometry sites, others preferred pencil and paper, and still others constructed models of their thinking. One student decided to use a traditional textbook. The students who needed to talk through their thinking could do so with their peers or with me. That’s how most people learn best, learning things from the inside out, and I don’t think lecture videos promote this. No. The thing that I didn’t expect was that my students created flexible groups, depending on what they were working on. They found peers who were working on the same concept they were, so that they could help each other. Sometimes they realized who they couldn’t work with on a particular day, and found a different group of peers to work with instead. And to solidify what my students were learning, we engaged in hands-on activities and labs that actually used the Chemistry concepts they were studying. For the first time, none of my students were left behind. Everyone learned Chemistry. Everyone received credit for the class. And my students became more adept at research, thinking, collaborating, problem solving, and reflecting on their own learning. Everyone finished on time. I’ve learned that inquiry & PBL learning can be incredibly powerful in the hands of students. I would never teach any other way again. When students own their learning, then deep, authentic, transformative things happen in a classroom. It has nothing to do with videos, or homework, or the latest fad in education. It has everything to do with who owns the learning. For me, the question really is: who owns the learning in your classroom? Interesting and timely, especially as I was getting warmed up to the idea of trying a flipped classroom.. As I see it, doing the flip may be a means to an end. I wonder if I can short cut and get the students to go direct to self learning. I think it’s possible to move students towards self-directed learning without using the flip. That’s the route we take now. Self-directed, student-owned learning is our goal and we move towards it using inquiry and PBL. 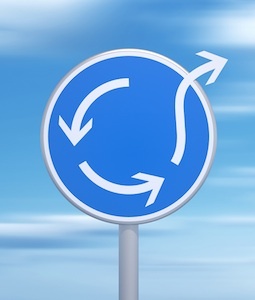 The flipped classroom was a concept that I struggled with when I first learned about it for the exact reason you stated “it felt more like we were juggling the traditional lecture around than moving forward into a new learning paradigm.”. I had that thought, maybe not so eloquently put however, I kept it to myself because I wasn’t confident enough in my knowledge of student centred learning. You have given me the confidence to trust in what I believe to be student centred learning and that it is okay not to buy into everything that is out there. On the other hand though, I see the flipped classroom now as a stepping stone for those teachers who are reluctant to release the reins of control to the students. It would enable them to witness the power of dialogue and students learning how to learn. Once again, a post that really resonated with me. I learn so much from you! Thank you! Thanks, Rayleen! For me this has been a journey of figuring out what student-centred learning looks like, and how to most effectively gradually release control to students. I think in some classrooms the flip would be a beneficial step. I don’t think there’s any one-size fits all method, but the end goal needs to be empowering our students to be thoughtful, critical learners. Hi Shelley. Thanks for a fabulous article and, as the poster before me said, so elegantly stating the limitations of the flipped classroom. To be honest I have never tried it wholeheartedly, in part since I viewed it as just another tool in the teacher arsenal (and not a great one at that) and not a teaching philosophy as so many around me have pitched it as. Your reasons for abandoning it and vowing to not return to it were refreshing and thought provoking. I often read your posts about pbl and student-centered learning environments with intrigue and desire to implement some of your ideas/philosophies into my own HS biology classes. I will admit to dabbling in it but not yet wading in up to my waist – that water is cold! However, after reading your approach to the stoic unit you described above I am once again pondering how I might take a similar approach in a 10th grade biology class I will be doing next semester. I have about a dozen questions concerning how you approach certain aspects of such a classroom but will keep it to this one: at the end of the unit, after the kids have learned their own way, built the class wiki/resources, performed a number of lab exercises, etc, how do you go about assessing them? I’ll leave it at that for now, but it is tough to do so with so many questions! Thanks so much! For me, this has been a long process. In fact, the class that I put off changing until last was my Bio. It was difficult for me to comprehend, at first, what this would like. One day, I just decided that putting it off wasn’t going to make it any easier. The most important part is the unteaching. Showing & explaining to students why we’re changing. I’ve never had students that didn’t “buy in” and see the importance. Our assessment runs througout the semester. There tends to be a project & research for every unit. I have individual or small group discussions with them almost everyday, which allows me to hear their thinking. Individual student learning can be assesed via blogs or journals. To be honest, I try to assess as little as possible, at least summatively. Then it becomes about the learning for my students. My students also design and complete labs, which are also assessed. Another interesting well explained blog! Thank you for being so honest and open about “the failures” and corrections aspects of your ever-evolving approach to helping your students to educate themselves. I fully agree that learning how to acquire information and knowledge is degrees of magnitude more important than learning how to recall previously acquired facts. Thank you for this reflection! I have been struggling with the concept of the flipped classroom for over a year now. I think flipping now and then for a change or to use as a stepping stone to helping students to access information independently is great. But as a full classroom/school movement- just made no sense to me. Whether you are lecturing in person or via video- you are still using the traditional method of learning. There is no hands on, other than the occasional click of a mouse button to start/pause. Student-centered, hands-on learning is still number one in my book. I applaud you for trying something new, and I admire you for your honesty in reflecting upon the outcomes. Thanks, Samantha. I agree wholeheartedly! Flipped classroom is one tool in the teacher’s toolbox. Should it be the only tool? Heavens, no! But sometimes it can be used to provide the necessary prior knowledge for students, so that the transformative learning CAN happen, when the concepts are understood better from the beginning of the unit/course/class/whatever learning entity. Combining cooperative learning with cognitive approach (learning to learn & executive functions) in a constructive framework is one of the secrets of Finnish education excellence. I recommend giving it a try, wholeheartedly. Well Shelley, I’m not sure if I love your posts or should stop reading them altogether! For the last two years I’ve worked tirelessly to change how I teach – hundreds of hours have been spent renovating my classroom over the last two years. However, I realized that my renovations were still going to leave me with the same teaching foundation and that for true change to take place I needed to move. So I ditched almost everything connected to my old way of teaching and moved into a house with a completely different paradigm. Today my classroom is a totally different place than it was two years ago. Real learning is happening in my classroom. Today, when I read this post, I had a another fortunate/unfortunate realization – my students still don’t really own their learning. Although they now know what learning is and how people learn, the curriculum still belongs to me. Even though the curriculum I’ve created is good and meaningful, it’s perhaps not as authentic as I would like it to be because it’s still coming from me – not my students. (sigh) It looks like another renovation is in order! Will there ever be a time when I can look at my teaching and think to myself that I’ve finally come to a good place, or is teaching by nature a Sisyphean task? Have you arrived? Can you tell me what the view is like at the summit? Great post and very informative! I am a High School 12th Grade teacher and sometimes find myself racking my brain trying to think of ways to engage my students in ways that I haven’t before, all the while making what we’re learning interesting and this sounds like a tactic worth trying. I just read a great book you might like and also find helpful, it’s called “Teach Like A PIRATE” by Dave Burgess. You can check him out and get the book right from the website http://daveburgess.com/. Thanks for the post! Hi Shelley, we met at Fraser Heights last week. Thanks for this post, very interesting to read more details after hearing you mention your disenchantment with the flip. I am an English teacher, and I guess the flip seemed to me not much different than just getting the kids to do the reading at home so we can talk about the book in class. Basically, as you say, homework! Now for me, I think once in a while we can ask kids to do reading at home, but I sure don’t give much. For me, the first great gestures I made towards kids taking ownership of their learning was getting them to design the projects for each unit. For instance I would say, OK, we read this novel. You all understand it in slightly different ways because you are all individual readers. How are you going to show me you “get it?” Then each student proposes to me their project. They can work in groups, they can work alone… and I approve their proposals only based on scope – like the work should be about even… so someone can’t hand in “stick man cartoon of chapter one” and another person makes a feature film riffing on the theme. Then we spend time as a class making the criteria. It has worked well so far, and the projects are interesting! Shelley, great article. I recently began changing my traditional classroom. Last week we started a new trimester. I began implementing aspects of the flip(I prefer the term blended learning). My first step was to reverse the traditional classroom format. I organized my course in terms of learning goals and then recorded lessons using educreations. I like this aspect because it can meet individual needs. Unfortunately, it is still lecturing in a different format. The learning is still not relevant and meaningful. One aspect that I have implemented is I allow students to decide on the amount of practice work they need. As expected students were receptive to having control over this aspect of their education. Several students requested additional practice work. Student also have access to answer keys so they can grade and submit their homework assignments directly to me. Using Edmodo I can easily track student progress. Now, while I feel I have made strides towards creating an awesome learning environment for my students, I know I have just reinvented the traditional classroom. How do I go beyond. I have a Masters degree in Educational Technology so I have knowledge and skills in many new areas of Ed-tech, but I am struggling with my next step. One major drawback is I am the only teacher in my department who is willing to try anything new. Thoughtful post, Shelley. My issue with articles promoting the flipped classroom was the feeling of permanence. A classroom was flipped. End of story. I don’t mind flipping a lesson or two (although the videos will be used in pairs for discussion and for differentiation rather than for homework). But “flipping” should be another lesson in our teacher toolbox – a tool to use if/when we feel it is really the best for students and their particular learning needs. Pingback: Surrey Connect News – Innovative Learning » Innovative Teaching – 21st Century Learning! Thank you very much for sharing your thoughts and practical journey in to PBL. As a former Chemistry lecturer, I can understand how daunting it must have been to trust each and everyone of your students to make that journey themselves and to trust that they would reach the final destination. I think what particularly helped in the case of stoichiometry, was your approach in the beginning to lay down the foundations of objectives and time scales. The outline of ‘knowledge to be gained’ must have helped your students map out their own learning process significantly. 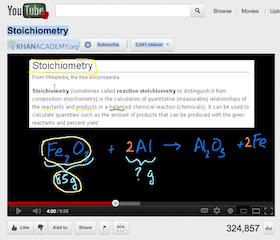 I’m curious though, did you not have any student who questioned the ‘point’ of learning about stoichiometry? or were they a higher achieving class anyway? I suppose the question really is how did you get them to ‘own’ the curriculum? Oh and yes, I completely agree about the flipped classroom, a lecture is still a lecture by any other name!